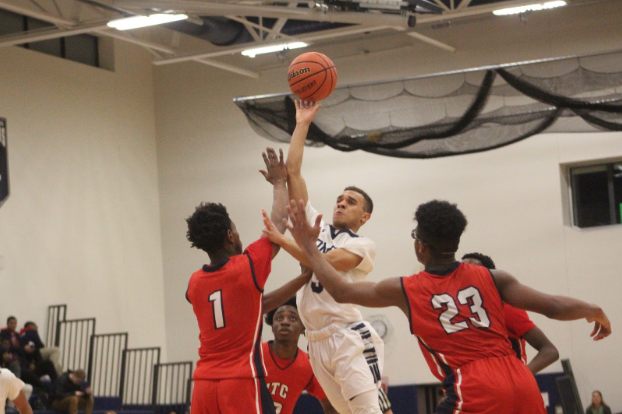 HOMER, N.Y. — It was a tough loss for the Trojans as they lost by 17 points against Institute of Technology Syracuse Central Tuesday night by a total score of 53-70. Homer trailed 22-34 at halftime, but the Trojans started to spark up both their defense and offense at the beginning of the third quarter outscoring ITC 14-13. Jarrett Wilbur came up with several big blocks for the Trojans, while Malik Redding and Mikyle Franklin led the offensive attack. At one point, Homer was only trailing by eight. ITC took the game back in the fourth quarter, outscoring Homer 23-17, due to a number of turnovers from Homer. Redding led all scorers for Homer with 20 points, six of them coming from behind the arc. Franklin also scored two 3-pointers with a total of 12 points in the game. Rashaun Mike Johnson lead ITC in scoring with 15 points, eight of them in the fourth quarter, while Edwin Seton scored 14 total points with eight of them coming from the first quarter. Homer ended up making only 69 percent (11-of-16) of their free throws, while ITC made 92 percent (11-of-12) of their free throws. Homer is now 3-12 overall while ITC is 7-10.